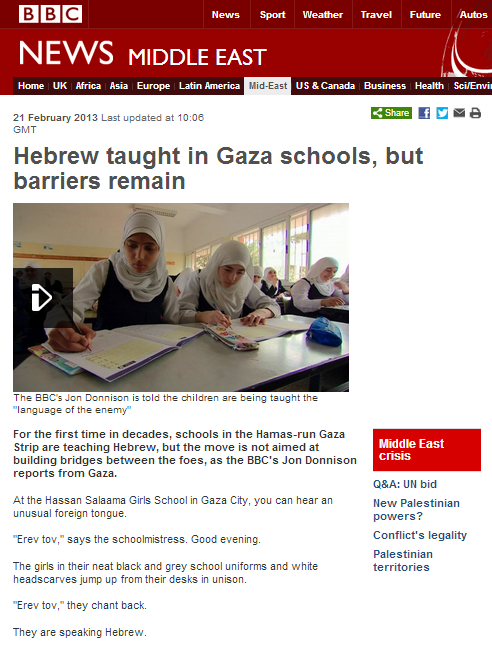 On February 21st 2013 the BBC published two versions of the same report by Jon Donnison about Hebrew being taught in schools in Gaza on the Middle East page of its BBC News website – one written and one filmed, with the latter also shown on BBC television news. 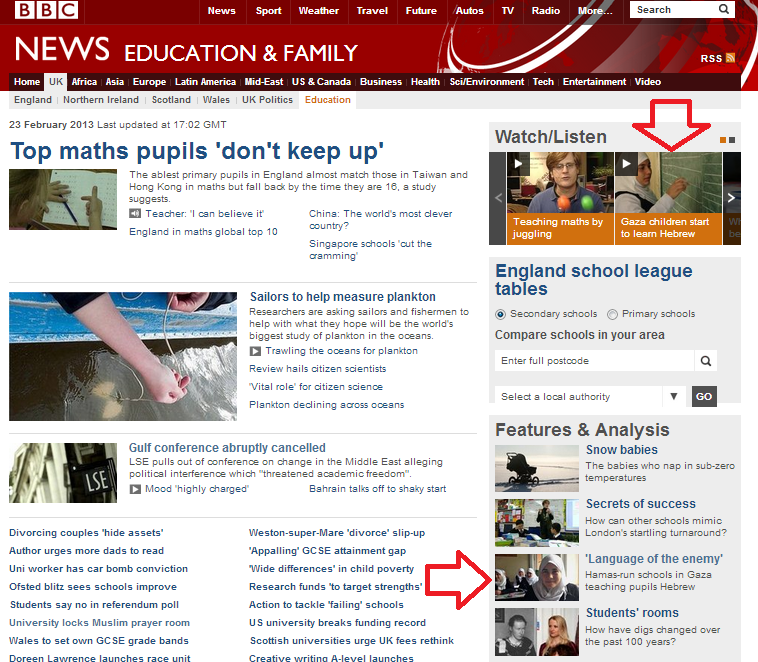 As previously pointed out here, both reports also appeared on the BBC News website’s UK Education page. Another version of the same story was also featured on Radio 4’s ‘PM’ programme on February 26th – available here for a limited period of time from 41:38. In that version, at 43:37, one can hear a translator interpret the words of interviewee Nour Adwan as “If we meet an Israeli and they are speaking in Hebrew..”. Sharp eared listeners will notice that the fifteen year-old actually says the word “Yahud” – Jew – in Arabic rather than “Israeli”, but for some reason, the BBC chose to modify that in translation. In all the versions of this report, Donnison too does some pretty nifty rearrangement of the facts in order to make them fit in with his own narrative. “In actual fact though, there is very little practical use for the language. Only one of the 30 or so girls in the class has ever met an Israeli or been to Israel, and that was when the girl was getting medical treatment there. At the Erez checkpoint, the main border crossing into Israel from Gaza, with its caged walkways and automated steel doors, there is very little traffic. In previous generations, tens of thousands of Palestinians used to cross into Israel every day for work. Many older Gazans speak good Hebrew as a result. But Israel’s blockade of Gaza and the ongoing conflict with Hamas means those days are gone. Israel, as well as the United States and the European Union, regard Hamas as a terrorist organisation. Israel issues few permits for Palestinians to leave, citing security reasons. The Israeli human rights group Gisha, which campaigns for better access for Palestinians to and from Gaza, says in January 2013, on average 174 Gazans were allowed to leave through Erez each day. “..there’s little practical use for the language. Thousands of children across Gaza are now learning Hebrew in Hamas schools but the truth is, very few of them have actually been to Israel and very few of them have ever met an Israeli. An identical message is conveyed in the radio item. So in all these reports, Donnison suggests that Palestinians stopped travelling to Israel because of the partial blockade initiated in mid-2007 after the violent Hamas take-over of the Strip and the expulsion of the internationally recognised Palestinian Authority by Hamas. In doing so, Donnison airbrushes out of the picture the fact that passage in and out of the Gaza Strip had to be restricted several years prior to that because of the entry of suicide bombers and other terrorists into Israel and the resulting civilian casualties during the second Intifada which began in September 2000. In other words, Palestinian actions which resulted in Israel having to implement measures to defend its civilian population are converted by Donnison into punitive unilateral Israeli actions. And what of Donnison’s claim in both articles that there is “little traffic in or out of Gaza”? In the written report, Donnison quotes his old favourite, the political NGO ‘Gisha‘ as saying that a daily average of 174 Palestinians left the Strip during January 2013. That would mean that 5,394 people made the crossing in the month as a whole. Even if accurate, those figures mean little when presented without context. “A report published in 2012 by the World Health Organization (WHO) reveals figures showing the coordination and liaison efforts invested by Israel and COGAT seeking to approve the entry of Palestinian patients from the Gaza Strip into Israel for medical treatments in Israeli hospitals. The key data presented in the report show that 91.5% of the applications which were filed, asking for medical treatment in Israel, were ultimately approved, 7.2% are pending security check and 1.3% of the applications were rejected, this indicating the attitude of the State of Israel to humanitarian and medical cases and the importance and urgency ascribed to such applications. In addition to those entering Israel for medical treatment, farmers from Gaza often visit agricultural exhibitions and conferences in Israel, as do other businessmen and professionals. Last Christmas, over 500 Christians from Gaza travelled to Bethlehem for the holiday celebrations. Whilst it is certainly true that “tens of thousands” of Palestinians no longer enter Israel from the Gaza Strip to work each day, it is significant that Donnison elects to conceal from his audiences the real reasons behind that, by failing to mention the role of Palestinian terrorism in bringing it about. It is also significant that he fails to make the connection between the kind of fanaticism which brought about the Palestinian decision to engage in terrorism and the frankly disturbing views expressed by some of the young interviewees in his report. It is, after all, such fanaticism which has made walls, fences and security checks necessary in order to prevent the loss of Israeli lives. 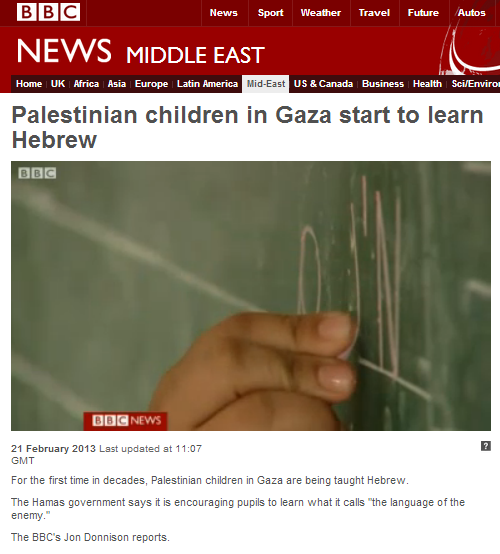 But of course to explain to BBC audiences the link between restrictions on the movement of Palestinians and the choice made by Palestinian society to support terror against Israeli civilians would make it much more difficult to turn this report – ostensibly about children in Gaza learning Hebrew – into a vehicle for the advancement of the standard BBC narrative of Palestinians as victims. 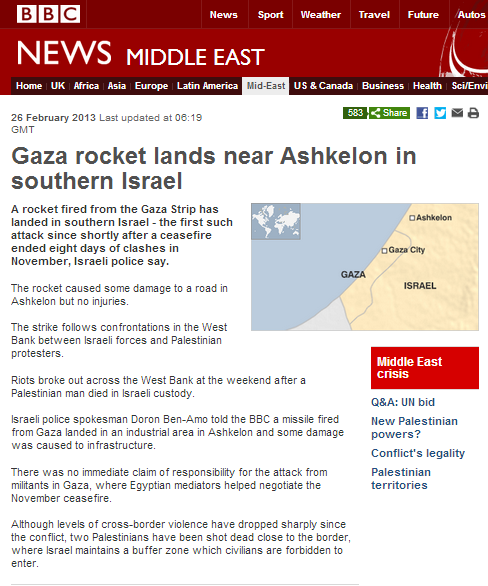 On February 26th 2013 an M75 rocket was fired from the southern Gaza Strip at the Israeli town of Ashkelon by what the BBC termed “militants”. 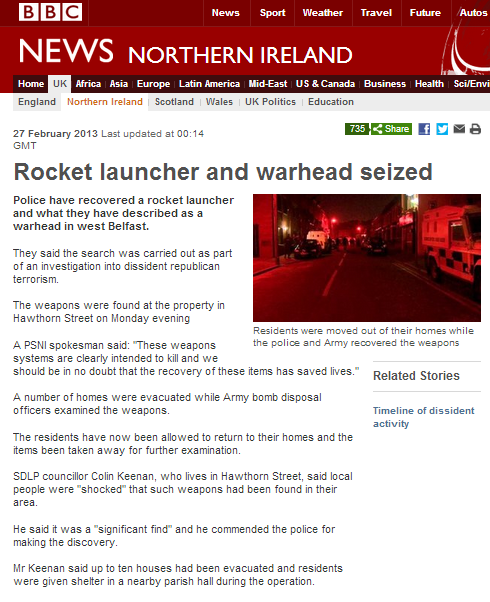 On February 27th 2013 the police in Belfast, Northern Ireland, discovered a rocket launcher and what the BBC termed “a warhead”. Fortunately, the device was not fired at civilians. Comparing the language – and punctuation – used in the BBC’s report on the discovery in Northern Ireland to that which it employs when reporting on actual rocket fire against Israeli civilians is interesting. The word “warhead” is used in the article’s headline and in its strapline. That term is not employed by the BBC to describe the munitions used by Hamas or other terrorist organisations in the Gaza Strip against Israeli civilians. The word “weapons” is used four times throughout the short article. That term is usually used by the BBC in connection to the Gaza Strip only when discussing the smuggling of arms or arms stores; it is not used to describe the actual rockets fired at Israeli civilians. The BBC never uses the word “terrorism” to describe the actions of what it consistently terms “militants” in the Gaza Strip, except when quoting others – usually Israeli officials – and even then the word is usually placed in quotation marks. One can be fairly confident that the BBC will not be setting up an interview between the police spokesman and Mishal Husein so that she can ask him how many residents of Northern Ireland were actually killed by “home-made contraptions”. Notably, the BBC does not suggest any kind of linkage (implying extenuating circumstances) between the discovery of the weapons and the actions of Protestants in Northern Ireland or the policies of the British government. In this case, the BBC has managed to report the story for what it is: the illegal possession of military-grade weapons by a terrorist group which threatens civilian lives. It is a pity that the BBC is so often unable to apply the same standards of reporting to certain parts of the Middle East. Doubtless readers have not forgotten the recent spate of binge reporting by the BBC which culminated in no fewer than four reports in under a week on the subject of a group of racist fans at Beitar Jerusalem football club and the torching of the club’s offices. Interestingly though, the BBC’s interest in the story suddenly seemed to wane when, last week, the police arrested two fans in connection with the arson at the club’s offices, with a third suspect also arrested the following day. Two of those arrested are to be tried for arson. This type of hit and run reporting only contributes to the impression that it was not the story itself which was of interest to the BBC, but the opportunity to exploit an incident in order to shape audience perception of Israel as a country riddled with racism. On the morning of Tuesday, February 26th 2013 an M75 missile was fired from the southern Gaza Strip at the town of Ashkelon, violating the ceasefire which brought Operation Pillar of Cloud to an end in November of last year. Fortunately, no injuries were sustained. The BBC’s report on the subject appeared in the Middle East section of its BBC News website. Our friends over at The Commentator have some interesting observations regarding the linkage suggested in this short article between the rocket fire and the ongoing riots in Judea and Samaria which – contrary to the statement in this article – did not ‘break out’ “at the weekend after a Palestinian man died in Israeli custody”, but are an escalation of a chain of violent incidents in that area over the past few months. This description whitewashes the fact that since the November ceasefire, there have been repeated attempts by Palestinians from Gaza to damage and breach the border fence (mostly unreported by the BBC), instead implying that Israel shoots Gazans simply because they happen to be in the wrong location. The incidents referred to in that distorted paragraph are this one and this one. The BBC article also fails to point out that the M75 missile was developed by Hamas and is produced in the Gaza Strip, suggesting some degree of Hamas involvement in the incident. 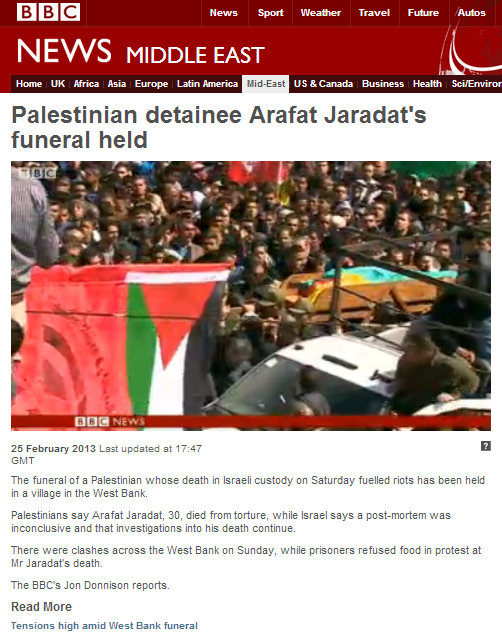 A filmed report by the BBC Jerusalem Bureau’s Jon Donnison from the funeral of Arafat Jaradat on February 25th 2013 in the village of Saeer near Hebron was broadcast on BBC television news. “According to sources within the Shin Bet (Israel Security Service), Jaradat was arrested on Monday, after residents from his village of Sa’ir outside Hebron said that he took part in a rock-throwing attack in November that wounded an Israeli. Jaradat confessed to the attack during questioning”. In fact, the spokesperson for the Israeli Prison Service initially said that Jaradat had “died of an apparent heart attack” – with apparent being the operative word. Donnison’s unquestioning repetition of claims by “Palestinian doctors” (actually, just one Palestinian doctor – the PA’s chief pathologist – was present at the autopsy) is especially bizarre in light of the fact that the results of the post mortem do not present any evidence to suggest that Jaradat was “badly tortured” at all. The BBC report then cuts to an interview with Issa Qaraaque, the PA Minister of prisoner affairs who – apparently having no need to wait for the results of the autopsy – had already begun flinging about accusations as early as Saturday evening; just hours after Jaradat’s death. Donnison neglects to mention that Jaradat was a member of the Al Aqsa Martyrs Brigades, that he was given a military funeral or that many of those present at the funeral were students from the Birzeit and Al Aqsa universities bussed in for the occasion by the Palestinian Authority. Donnison fails to inform his viewers that the “clashes” are the result of attempts by the IDF to prevent rioters from blocking roads or reaching areas inhabited by Israelis and that these riots are orchestrated. Yet again Donnison’s report fails to mention the terror connections of those Palestinian hunger strikers and the reasons for their detention. 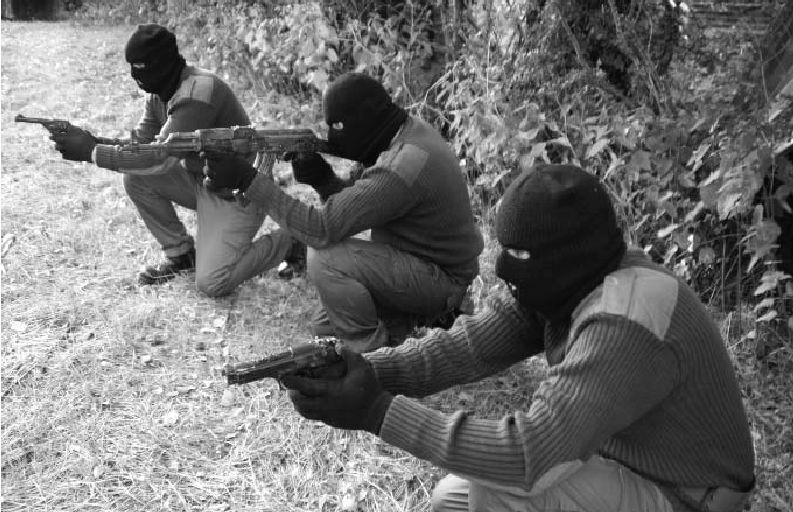 This report – like previous ones produced by the BBC on the subject of the PA’s current political campaign surrounding the hunger strikers, together with the associated organized rioting – leads to a couple of observations. The first of those is that the BBC appears to be avoiding presenting an accurate portrayal to its audiences of the bigger picture behind the rise in violent incidents in Judea & Samaria over the past few months (most of which it has not bothered to report at all) and the use of hunger strikers as leverage for a campaign which includes violent rioting. The second unavoidable observation is that some BBC correspondents and article writers are rushing to make their own contributions to the PA’s factory of incitement by regurgitating unverified allegations instead of waiting until the facts about Jaradat’s death become clear. This is not the behaviour of a reputable news outlet dedicated to accurate reporting of the facts surrounding the news. It is the behaviour of an organisation legitimising dangerous propaganda intended to stoke the fires of violent behaviour which – as has so often been the case in the past – could cost lives. 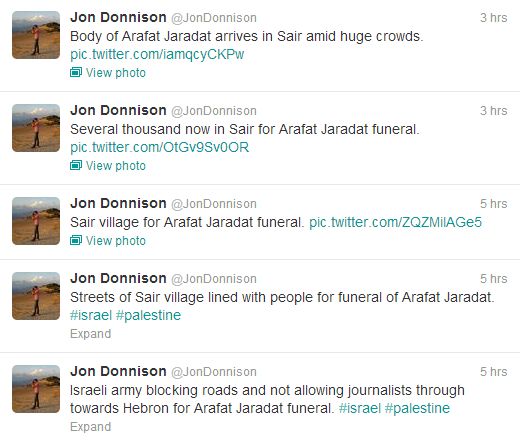 On February 25th 2013 the BBC sent Jon Donnison off to the village of Saeer near Hebron to cover the funeral of Arafat Jaradat who died of causes as yet unknown on Saturday at Megiddo prison. The resulting BBC article on the subject – which currently appears in the Middle East section of the BBC News website – is at the time of writing on its fourth version. Versions zero (original) and one can be viewed here, version two is here and version three here. To its credit, the BBC report does mention Arafat Jaradat’s membership of the Al Aqsa Martyrs Brigades although, true to form, it refers to members of the organization responsible for the deaths of hundreds of Israeli civilians as “militants” and fails to explain to readers what the organisation actually is and its connection to the ruling PA faction Fatah or to inform them of the fact that Jaradat was buried with military honours. “Militants from the Al-Aqsa Martyrs Brigades, to which Mr Jaradat belonged, fired into the air and vowed to avenge his death, AFP news agency reported. “Al Aqsa brigades, the armed wing of the Fatah national liberation movement, mourns with all pride its hero, the martyr of freedom, the prisoner Arafat Jaradat”. Interestingly, the BBC’s reporter on the ground did not apparently think it necessary to inform his readers of scenes from Jaradat’s funeral such as the one below, photographed by journalist Asaf Gabor. But the most notable feature about this article is the manner in which it juxtaposes the findings of professional criminal pathologists (not “morticians” as the BBC described those who carried out the autopsy on Jaradat in version two of its article, or even “physicians” as stated in version three) with the politically motivated, agenda-driven propaganda of a PA minister who not only was not present at the autopsy, but, along with several others, began an energetic campaign to promote the notion that Israel is responsible for Jaradat’s death literally hours after the event. “The father-of-two died six days later at Megiddo prison, from what the Israel Prison Service (IPS) said appeared to be a heart attack. Palestinian officials, however, said an autopsy, carried out by Israeli physicians showed he had suffered two broken ribs and had bruising. In the accompanying “at the scene” side box in the report, Donnison also uncritically repeats Palestinian claims – not only despite having no evidence of their veracity, but also in spite of there being no basis for such claims according to the initial autopsy report and with no cause of death having been determined so far. One would expect a Western media outlet which prides itself on its commitment to accuracy to be able to distinguish between the wheat of a scientific medical report and the chaff of agenda-driven rumour mongering. One would also expect that organisation’s self-declared role as an enabler of its audiences’ understanding of world events to cause it to refrain from presenting the factual and the fictional on an equal basis as though both were of comparative legitimacy. Audiences do not need to go to the BBC for a dose of rumour and speculation: for that there is a whole host of agenda-driven websites on the internet. From the BBC, audiences expect facts – not to mention the ability to distinguish between an as yet uncompleted autopsy report and an “inconclusive” one. In August 2011 thousands of people took to the streets in London and other English cities and engaged in several days of violence after a man was fatally shot by the police in Tottenham. 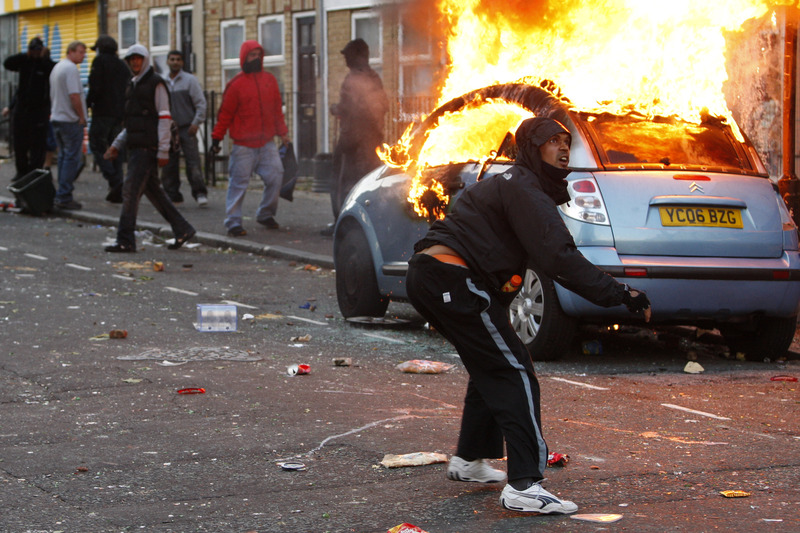 The BBC had no doubts as to what term to use to describe those actions: riots. Just three days after its previous article on the subject of Palestinian hunger strikers, the BBC published another report on February 21st about the riots – ostensibly in support of those hunger strikers – which took place at Beitounya near Ofer prison outside Ramallah on that day. That article – like the one before it – refrains from fully informing BBC audiences of the actions and affiliations of the four hunger strikers, despite the fact that – as previously documented here – the information is readily available. Interestingly, given the BBC’s close interest in the subject of journalists in war zones, the article neglects to mention that in addition to the injuries reported, three Israeli journalists were also injured by Palestinian stone-throwers. Channel 10 cameraman is evacuated after being hit by a rock in his chest. “Youths, gathered outside Ofer prison near Ramallah, threw stones and petrol bombs towards Israeli soldiers. 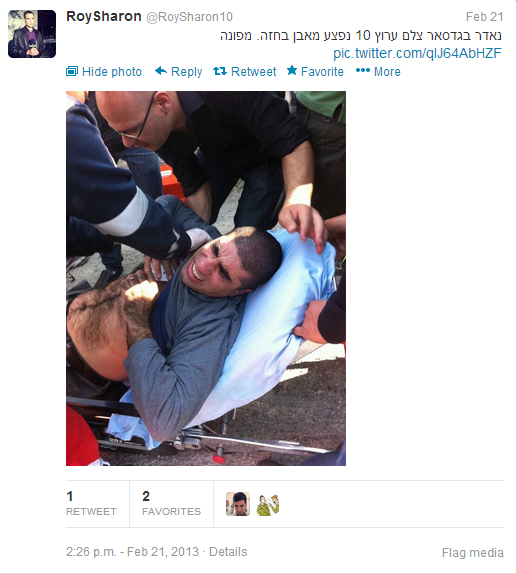 Evidently the BBC did not bother to check that latter claim with the IDF Spokesman’s Unit before publishing it. Issawi is actually connected to the DFLP (Democratic Front for the Liberation of Palestine) rather than the PFLP, but seeing as one of the few to make that same mistake is Wikipedia, one must wonder if the BBC has been using that notoriously unreliable source. Donnison fails to make it clear to his audience that Administrative Detention is not an exclusively Israeli phenomenon: sometimes known as ‘internment’, it is also used in his own country, in Ireland, in the US and in Australia. Donnison’s ‘explanation’ makes Administrative Detention sound like a pretty arbitrary affair, but in fact the practice is governed by strict rules. “In accordance with the Order Concerning Security Provisions applicable in the West Bank, a Military Commander (namely, a high-ranking IDF officer with specific authority) may order the administrative detention of a person if there are reasonable grounds to consider that taking such a measure is necessary for imperative reasons of security. • Such an order must rely on credible, current and reliable information, as detailed as possible, showing that the person poses a specific and concrete threat of a substantial nature to the security of the West Bank or its population. • Administrative detention is used solely as a preventive measure and only as a last resort, and cannot be employed where criminal prosecution is possible or less restrictive administrative procedures would adequately contend with the security risk posed by the individual. First, prior to the issue of a detention order, an independent military prosecutor provides a legal review through conducting an assessment of the order that is legally binding on the Military Commander. Second, once a detention order has been issued, it is subject to a multi-layered system of judicial review by the Military Courts in the West Bank. Detainees wishing to challenge detention orders may also file a petition with Israel’s Supreme Court sitting as the High Court of Justice. Detainees have the right to legal counsel of their choice throughout this process. • Administrative detention orders mostly rely on sensitive and classified information gained from intelligence sources. Due to its confidential nature, this information cannot be disclosed in full to the detainee or their attorney so as not to endanger the safety of the source or frustrate future intelligence gathering abilities. In these cases, detainees are provided with the general reasons for their detention. Donnison’s inaccurate portrayal of the Administrative Detention process, together with his and the general BBC failure to inform audiences of the terror connections of the hunger strikers and the downplaying of the organized rioting through use of words such as “protesters” and “demonstrations”, all combine to create an overall impression of a spontaneous reaction to an injustice perpetrated against passive Palestinians. That, of course, is far from being an accurate picture of the reality behind these orchestrated riots and the part they play in the political campaign engineered by the Palestinian Authority and intended to create leverage through international opinion against Israeli counter-terrorism measures. Whether or not the Palestinian Authority will be able to contain and control the violence it is currently mobilising for political reasons remains to be seen, especially in light of the fact that Hamas – which has greatly consolidated its power in PA controlled areas of late – is now rallying its supporters behind the same banner. What is clear is that the BBC’s consistent failure to accurately report the real political agenda behind the hunger strikes by Palestinian prisoners, together with its playing down of the associated organised riots in order to present them as some sort of legitimate protest, actively denies BBC audiences the ability to fully understand the real issues behind the news. When the BBC classifies violent events in London as riots, but rebrands similar events in Jerusalem, Ramallah or Hebron as “protests”, it should not be surprised if audiences view that as a clear case of double standards. On February 21st 2013, on the Middle East page of its BBC News website, the BBC informed audiences of the news that Barcelona FC plans to visit the region in an article entitled “Barcelona to play Middle East ‘peace’ match“. “It is not yet know [sic] who will make the one-day trip for Barcelona, but there are high hopes that star striker Lionel Messi will be among the visitors. In fact, that idea was scuppered the very next day by the President of the Palestinian Football Association Jibril Rajoub (also head of the Palestinian Olympic Committee), who dismissed the idea of a joint Israeli-Palestinian team. No update to that effect has been added to the BBC’s article. Of course such a move from Rajoub hardly comes as a surprise to anyone familiar with his record. “Last year the Spanish club inadvertently became embroiled in Middle Eastern politics when Gilad Shalit – the former Israeli soldier held by Palestinian militants in Gaza for five years – was a guest at its Nou Camp stadium for a match against archrivals Real Madrid. As readers may remember, the BBC’s coverage of that story at the time distinguished itself by a lack of accuracy and persistent downplaying of Sarsak’s connection to the Palestinian Islamic Jihad terror organization. “Last year the Palestinian Football Association (PFA) unsuccessfully lobbied European football’s governing body, Uefa, to stop Israel from hosting the continent’s 2013 under-21 championship over the issue of Palestinian players in Israeli detention. 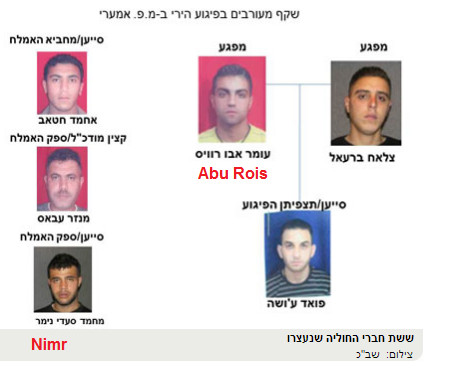 Mohammed Nimr actually plays for the football team of the Amari refugee camp near Ramallah and Omar Abu Rois (also a resident of Amari) is an employee of the Red Crescent in Ramallah – known for his connections to Hamas – when not playing football. The two were arrested about a year ago in connection with a terror attack against IDF soldiers on January 20th 2012 in which Abu Rois and his accomplice Tsalah Bara’al – also a Red Crescent employee from Amari – fired some 20 rounds of ammunition from Kalashnikov (AK47) rifles supplied by Munzar Abbas – an arms dealer from Amari who is also an officer in the PA’s ‘General Intelligence’ forces and responsible for the Red Crescent’s security guards. Mohamed Nimr was an accomplice to the attack and supplier of weaponry. After the cell’s arrest, it transpired that other terror attacks were also planned. The BBC, however, would apparently have its audiences believe that the only thing they need to know about these two men is that they play football. By concealing the reasons for their detention, the BBC not only fails to meet its obligations as far as accuracy goes, but also clearly tries to distort the audience’s understanding of the story, thus yet again compromising its own reputation for impartiality. Will the BBC’s Jon Donnison ever learn? For those not familiar with Twitter, the letters MT at the beginning mean ‘modified tweet’. In other words, Donnison took someone else’s Tweet and modified it before retweeting it to his own followers. In this case, the original Tweet came from the none too objective Reuters correspondent in Ramallah, Noah Browning, just seven minutes before Donnison’s retweet. Of course neither Browning nor Donnison have produced any evidence to support their claim that Arafat Jaradat, who died suddenly on February 23rd in Meggido prison, was “in interrogation” at the time of his death. At present, the suspected cause of death is a cardiac arrest, but the full investigation into the incident has of course not yet been completed. 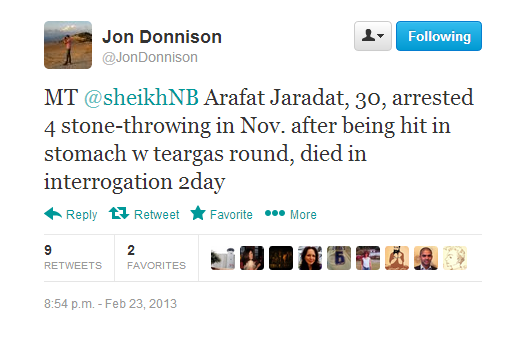 ” “Arafat Jaradat… was arrested a few days ago. He was killed during the investigation,” the Palestinian minister in charge of prisoner affairs Issa Qaraqaa told AFP. “Although the Palestinian Authority probably does not want an all-out confrontation between Palestinians and Israelis at this stage, some Palestinian Authority officials in Ramallah believe that a “mini-intifada” would serve the Palestinians’ interests, especially on the eve of Obama’s visit. The officials hope that scenes of daily clashes between Israeli soldiers and Palestinians in the West Bank will prompt Obama to exert pressure on the Israeli government to make far-reaching concessions to the Palestinian Authority. Donnison’s latest irresponsible contribution (hallmarked, of course, with the stamp of BBC reliability) to the reservoir of unsubstantiated accusations and rumours which feed these violent confrontations shows that he has learned nothing from his previous trigger-happy Twitter blunder. Some organisations committed to accuracy might see that as a liability. A foreign diplomat has to be evacuated under threat from a British university. A British MP flounces out of a debate at another UK university because of his opponent’s ethnicity. One might have thought that both those stories would have been reported at least on the respective regional pages of the BBC News website, if not in its UK section. But no: the February 20th incident (not the first of its kind at a UK academic institution by any stretch of the imagination) in which the deputy Israeli ambassador Alon Roth-Snir was prevented from speaking at Essex University (details here, courtesy of Avi Mayer) is not reported in either the Essex section, the England section or the UK section of the BBC website. Neither will one find in those latter two sections or in the Oxford section of the BBC News website any mention of George Galloway’s petulant exit from an Oxford University debate on the same day after discovering that his British-born debating opponent Eylon Aslan-Levy holds Israeli nationality. So perhaps instead, one may be thinking, the BBC chose to report these two dismal incidents in British institutions of higher education on its website’s UK Education page? Well actually no – but one can find two reports there on another subject: one filmed report entitled “Palestinian children in Gaza start to learn Hebrew” and one written article titled “Hebrew taught in Gaza schools, but barriers remain”. By any standards, those are strange editorial priorities.